Mudkippers must be the most humorous, bizarre, and interesting of fish. With googly eyes apparently popping out, dragging themselves along the surface of the mud on skeletal fore-fins, and gulping air as they go. This was utterly surreal for me; never before had I visited a mangrove swamp, never mind seen a mudskipper - and there were hundreds of them crawling around on the exposed mud around me interspersed with fiddler crabs. Photographing in this environment was mucky work, but I was like a kid in a sweetie shop, amongst these weird archaic creatures in this novel environment. To add to the comedy, the mudskippers would sporadically engage in Chaplin-esque leaps. With hundreds of them surrounding me, there always seemed to one going off like a firecracker somewhere. 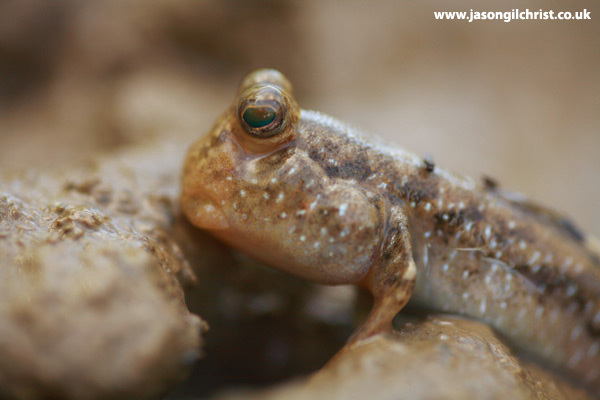 Mudskipper fish (Periophthalmus sp. ).